Are 3D films a concern for contact lens wearers? With the mainstream return of 3D films, those producing the technology for such movies have been advised to ensure the images are comfortable to watch. UC Berkeley optometrist Martin Banks told the San Francisco Chronicle that even the most modern 3D technology can cause vision fatigue after prolonged viewing, which may concern those with contact lenses. Talking with the paper about the current situation of making 3D films easy on the eye, professor Banks said: "The message is definitely getting out that we have to do some things to help people have a good experience." 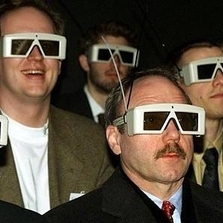 Despite the concerns, the publication said that vision experts are of the opinion that most people do not have to worry about their eyesight when watching 3D cinema. Many will no doubt continue to flock to big-name 3D hits such as Avatar and UP, both of which received BAFTA awards recently and are up for Oscars as well.